Are you an avid gun collector who is looking for a great way to store and display your firearms? A solid wood Amish Gun Cabinet can provide the attractive and functional solution you’re looking for. Our extensive selection includes expertly handcrafted cabinets in a wide variety of styles and sizes. Whether your collection consists of shotguns, rifles, revolvers or pistols, you’ll find the right product for your needs. Our Amish Gun Cabinet collection includes products made from solid, durable northern kiln-dried hardwoods such as oak, cherry, hickory and maple. A range of additional features are also available such as sparkling glass, dovetailed drawers, mirrored glass and antique hardware. We understand the importance of gun ownership safety as well, so our cabinets are also equipped with locks on drawers and doors to limit access. And with the unsurpassed Amish craftsmanship, you can be sure your gun cabinet will remain sturdy, safe and secure for as long as you own it. We feature an extensive lineup of Amish gun cabinets, and we understand trying to pick the right one can feel challenging. You may be wondering what the differences between our solid wood gun cabinets are and why you should choose one over another. Do you want your safe to go in the corner? If so, we have specially made wooden gun cabinets such as the Corner Swivel Gun Cabinet in Oak that will fit perfectly into the corner of any room. Do you want to be able to see your guns? 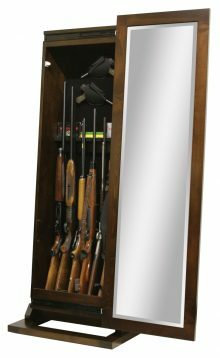 We offer oak gun cabinets with glass paneling to display your guns, such as the Mount Eaton 10 Gun Cabinet in Oak, for those who want a full view of their firearms. If you prefer to keep them out of view, try the Sliding Door 8 Gun Cabinet in Oak, which hides your guns behind a wood panel. How many guns do you want to display? Certain cases can hold up to 12 guns, but if you have fewer to display, you can get a case with storage for six or eight. Often when people buy our wood gun cabinets, they intend to put them in a small room. They want to display their guns, but they want them in a place that’s not as high-traffic as a living room or bedroom, in order to keep them safe. We make smaller Amish gun cabinets for this purpose. You can squeeze a safe such as our 6 Gun Sliding Door Cabinet in Oak into any room because it measures less than three feet wide. You could also try a corner safe, as those take up very little room and fit snugly in a small area. Decorating the top of the cabinet. You can put small baskets, flower vases and decorative dishes on top of your gun cabinet to tie it in with the rest of the room. Choose knickknacks that have sentimental value to display in this special place. Playing up an accent color. You can work in an accent color all around the room where you put your new gun safe and on the safe itself. If you choose red, for instance, put a red runner on the cabinet and on your coffee table. Getting matching furniture. Buying a furniture set to match your gun cabinet brings together the entire room. You can find matching furniture at AmishOutletStore.com. Whether you put your new gun safe in the living room or your bedroom, we have furniture sets that match the grain and design of each of our gun cabinets. You get the added bonus of receiving quality-made Amish items you feel confident will last for a long time. 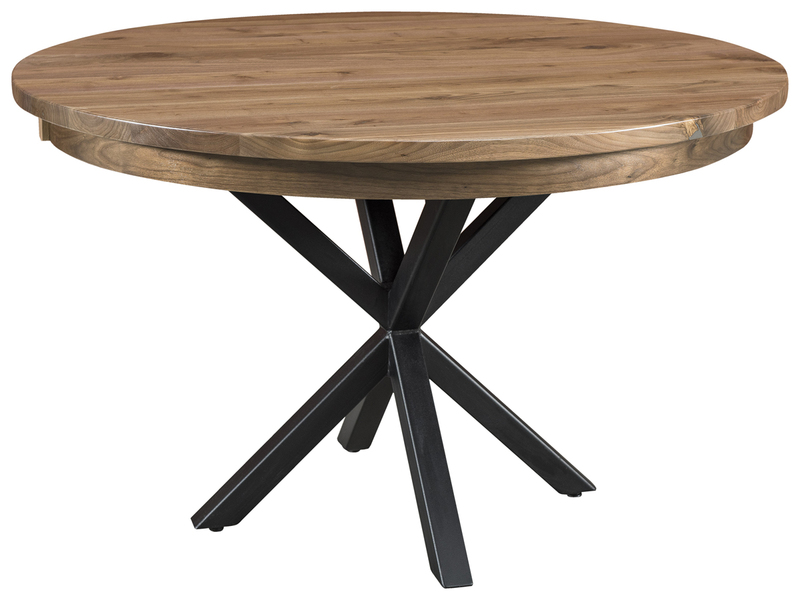 Youll get a great price on Amish furniture at AmishOutletStore.com. Purchase any gun cabinet from our collection today and get up to 33% off the regular retail price. You can experience even bigger savings by combining your cabinet with other furniture items to get the full benefit of our large order discount. We even offer a discount just for paying for your order by check. Take a closer look at our selection of handsome solid wood Amish Gun Cabinets today!